— Tate returns the second-half kickoff 35 yards out to Auburn’s 39. I’m waiting for the flag … waiting … waiting … no flag? No flag! Ah, the march of progress: we’ve gone from short returns to long returns with flags to now long returns with no flags. Next step is paydirt, baby. — We can be honest about this: Todd ought to already have, like, at least three more interceptions this year, and here’s another escape on 3rd-and-4: Tennessee ignores Stallworth faking another pseudorooskie (how are they even going to see him doing the fake? Isn‘t the point of the formation that he‘s not seen?) and the strongside end hits Todd as he throws. The ball flutters oh-so-invitingly into the air but falls harmlessly to the turf between three different Tennessee defenders a la the blooper just over the second baseman’s head. Three-and-out is not what I had in mind for Auburn’s first drive of the half, but after that thick slice o‘ luck? No complaints. — Fannin breaks loose on the reverse for 32 (check out Darvin Adams mauling the Tennessee corner–he’s gotten worlds better at that just in the last few weeks); next snap, Tate breaks loose off the right side for 15 and is only caught at the five because Rico McCoy is a certified badass. It’s awful nice having an offense that can go from their side of their field to 1st-and-goal before you’re back from the fridge, isn’t it? — Of course, it would be even nicer if they could stick the ball in the end zone. On first down Tate fumbles on the 2 (terrific reflexes by Adams to recover–he’s had as fine a drive as you can have without a reception); on second Burns is lucky to get back to the line-of-scrimmage; and on third down Burns makes a wonderful play to back out of a failed Wildcat play-action and scramble until he finds an open McCalebb in the end zone …who drops the hell out of it. Dammit. 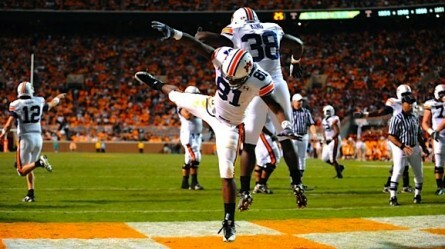 I hope Auburn remembers to sweep up afterwards with all the points they’ve left on the field. Against any other SEC opponent (non-Vandy division) I’d recommend going for it here (Auburn’s still on the 2, after all), but three sure points matter a bit more against Tennessee. Byrum hits the field goal, 16-6 Auburn. — Hardesty picks up 10 on the first play of the Vols’ ensuing possession, but we know they won’t stick with the run … Oh. They do, actually, as Hardesty carries on the next two plays as well. Unfortunately for the Vols Auburn shows why all-MANtario all the time doesn’t always work out, either, stuffing him and setting up a 3rd-and-8 which ends predictably. Punt. — So usually I just ignore the endless ESPN/ABC promos, but because this is the Packers vs. Vikes Favre Bowl they’re hawking, we get the old footage of Favre and Southern Miss upsetting the 1990 Tigers WHICH THANKS FOR THAT REALLY. — Andrews reports that the Tennessee defense is “gassed” and “exhausted” and chugging Pedialyte (how weird is it that doesn’t surprise me in the least? ), which sounds great … but, uh, Berry’s quick close on a promising second-down McCalebb run and the hair-trigger blitz that causes the third-down incompletion don’t exactly have a gassed, exhausted look about them, I have to say. Punt. — 4th-and-inches for the Vols after a tremendous open-field tackle by Washington, and Hardesty is … on the sideline? The call instead is … play-action? And Crompton … completes it for the first? That was just weird all the way around. It doesn’t end up mattering, what with the two ensuing runs for nothing and patented Crompton misfire on 3rd-and-11 … but still weird. Punt. — McCalebb finds some redemption for the TD drop, turning on the hyperjets to transform a worthless busted 3rd-and-8 screen into a first down. Nessler says he’s been impressed by McCalebb, and you know, so have I, Brad. So have I. — Man coverage on a swing pass to Fannin. Look what happens: 1. Todd throws the ball accurately 2. Trott gets his block done and 3. Fannin picks up 16 quick ones. I know I go on and on and on about this play on this blog, but dammit it works so beautifully when it, you know, works. 1st-and-10 on the Vol 11. — Wide screen to Zachery, and McCoy has him dead to … nope, Zachery’s still free, but this No.15 has a bead on him … Nope! Zachery, end zone, TOUCHDOWN! Blackledge says that Tennessee’s missing those tackles because they’re tired, and particularly where a monster like McCoy is concerned, I tend to think he’s right. Tee hee hee! Byrum kicks the extra point, it’s 23-6, and unless the Vols somehow storm down the field for a touchdown, this game is over. And what are the odds of that? — Screen to Hardesty, Bynes and Washington trip each other up, McFadden misses the tackle, and there he goes. Touchdown, Vols. Oh well, 23-13 is the same score Florida won by and the Gators gave up a couple of these drives, too, so no cause to put on the sad face just yet. — McCalebb fields the kickoff and … holy crap, where is all this room coming from? He’s out past the 40 before the Vols even know what’s going on. Oh please oh please oh please let this be because Auburn is suddenly good at kickoff returns and not just Tennessee is bad at coverage. Please. — All right, Auburn offense, you got great field position, let’s put some points on the board and put any of this comeback nonsense to rest for good. Ahem: losses of 4 on second down do not help put points on the board, Tate. Ahem ahem: passes thrown behind the receiver (Fannin, who else would he throw behind?) that are subsequently bobbled and gain only five yards when we need seven do not help put this comeback nonsense to rest, Todd. Punt. — We’re even on the potentially killer second-half interceptions, Vols: on first down Bynes reaches up and swats a ball Etheridge was breaking on and would have picked with ease. So it goes. — Let it not be said that Crompton can’t complete short passes–he did so with a certain amount of effectiveness against Florida and did at various points last year as well–and with Auburn playing some seriously preventative defense, the Vols work their way down the field 4, 5, 6 yards at a time. I think Auburn has them on 4th-and-6 on the Auburn 44, though, because what are the odds that this offense converts three must-convert-or-the-game-is-over fourth downs? Not long enough, apparently: the little outside rub route that’s gotten Quinton Hancock open twice already flummoxes McFadden and Washington again, and this time he neither drops it nor watches it sail out of bounds. 1st-and-10 on the 22, and let me tell you, Auburn, if this is your idea of a joke, it’s Not Funny. — Oh heavens, they’re at the 11. At the 6, first-and-goal. To the 5. Incomplete! Third-and-goal. Penalty! Third-and-goal from the 10. Batted down! Mike Blanc is good at that, man. Field goal kicker out, and even though it’s good, we can breathe just a touch easier now. I wasn’t prepared for this to be a three-point game, I just wasn’t. — Kickoff, McCalebb , has some room again… is he gone?!?! No, he’s not gone, but getting toppled over by the kicker at the Tennessee 39 isn’t half-bad, I dare say. Huge, huge play–even if the Vols get the ball back, they’ll have the length of the field to go for the tying TD, and that’s assuming Auburn doesn’t pick up the mere 10-15 yards they need for a clinching field goal. Wait: it was 23-6 earlier this quarter, there’s 4:11 left in the game, Auburn’s on the Tennessee 39, and the game’s still legitimately in doubt. How did it come to this? Come on, Auburn, everything will be better with a score on this drive. — The option goes nowhere yet again on first down, but Tate reverses field and somehow turns it into eight yards. Tremendous play–he and McCalebb have both been fabulous tonight. Speaking of, FAST goes for 3 and a big first down. Measurement timeout. Burns goes Wildcatting for 5. Timeout Tennessee. Tate for 3. Timeout Tennessee. I’ve had trips to the DMV that moved quicker than this. — Todd hits Smith on a little out for the first down … and more! He takes it to the 5, and unless Byrum honks a chippie, everything else is academic. Though this bizarre delay to get the clock set right and the accompanying teeth-grinding feels more aggravating than academics ever were. — Andrews reports on Kiffin’s popularity on the Internets, complete with the vague suggestion that Tennessee is recruiting better than Auburn because of the Hype. Sorry, Erin, no sale: I don’t see high school seniors getting all that fired up over the number of Hello Kiffin mentions at EDSBS. — Three straight runs smack up the middle later, Byrum’s on. Hit this, Wes, and we all go home. — It’s good! 26-16, Auburn wins! 5-and-freaking-Oh. Still unbelievable. War Eagle. — Hey, Tennessee is trying to put more points on the board, even though there’s just 39 seconds left when Byrum kicks off. Honestly, I don’t blame them: Tennessee’s offense needs every good vibe it can get. Blanc helps out with a roughing the passer, and the Vols wind up a couple plays later on the Auburn 32 with a couple of cracks at the end zone. — Well, I’ll be damned: Denarius Moore comes down with it in the end zone on the last play of the game, right in front of McFadden, who I hope remembers that when he’s preparing for Arkansas this week. (If I know McFadden at all, which I really don’t, but pretending I do, he certainly will.) Now it’s particularly nice this game is on ESPN: more people with the chance to notice this was not a four-point game. — Kiffin signals for 2 after the TD, but you don’t get to try an extra point if it can’t affect the outcome of the game, so it ends 26-22. I know a lot of Auburn folk seem a little bothered by this, but … eh … so he wants to score as much as possible. Let the kid have his fun. It’s kind of cute, in a way. — And that’s it. On to Fayetteville, with a chance to turn this fun ride into something much more serious. War Eagle. That’s not real, that’s safe, no-lose, whatever you want to call it. You try your hardest to say we aren’t good without actually saying it, so if we lose, you were right, if we win, no one cares because we won. You play this off as “real”, but it’s all about no-lose. Uh … I said that about Todd because he’s thrown into coverage more than once and because you don’t throw as often as Todd has while throwing a single interception without a certain amount of luck. That’s it. It has nothing to do with whether I think the team is good or not, which, hey, thanks for overlooking the parts where I rave about Tate, McCalebb, Adams, Todd, etc. for the brief statistical claim that’s slightly on the negative side. Just wanted to say this is by far my favorite read of the week out of any website and any articles period, mainly because of the little things you comment on after certain plays. Which is about half the time what im really thinking but dont want to say. About sometimes showing negativeness, when you have so much emotion tied into a game its hard to be positive after every play and I lose it sometimes whhen the other team gains two yards but it took longer than expected to bring the guy down. Keep up the good work, its nice to have funny stuff to read when i don’t feel like studying.